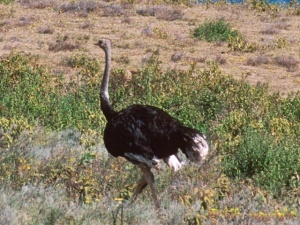 Ostriches are common here. This open grassland supports other variety of bird such as Kori bustard, Larks, Fiches and Raptors. The park is home to the amazing Lilac-breasted roller and three endemic species of Tanzania: Fischer's Lovebird, Grey-romped spur fowl and Babbler-like rufous-tailed weaver. 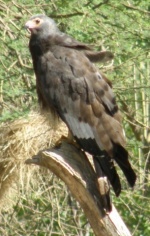 Raptors and acacia associated birds, and three endemic species to Tanzania: ashy starling, rufous-tailed weaver and black collared lovebird are commonly seen. Ostrich and kori bustard are also seen here. 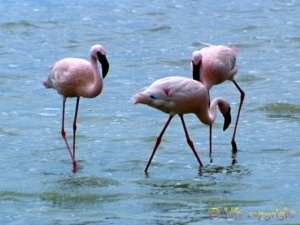 Flamingos are common at Momela Lake, though the bird life on these lakes vary seasonally. From October to April the lakes are populated by the water fowls from Europe, and the rest of the year the residents birds grebes, pilchards, eagles and geese dominate the lakes. 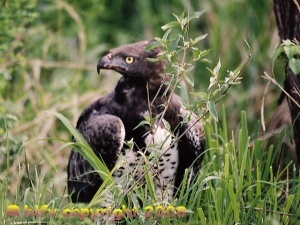 I even saw the Martial Eagle. Owing to its Soda Lakes, the crater provides a breeding ground for flamingos, crown cranes and other water birds as waders, ducks and herons. 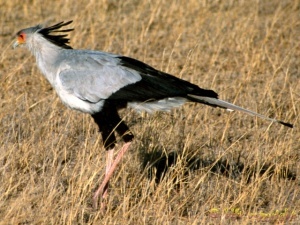 It is also a good place to see striking ground bird such as Kori bustard, which is regarded as the world's heaviest flying bird. You are more likely to see ostrich here, as well as migrant storks during the rainy season than any other time. 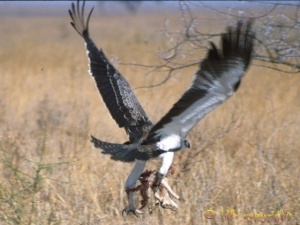 Birds of prey commonly seen in Ngorongoro are the augur buzzard and the foppish long crested eagle. Some of the species include Eurasian migrant birds, raptors, acacia associated birds, and three species of bird which are endemic to Tanzania: the ashy Stirling, refocus-tailed weaver and black-collared lovebird. lucky people could see all these birds ! ostriches, cormorants, pelicans, African darters, little egrets, herons, storks, ibis, saddledbill storks, marabou storks, hammerkops, yellow-billed storks, African spoonbills, flamingos, ducks, Egyptian geese, teals, eagles, goshawks, buzzards, bateleurs, black kites, secretary birds, vultures, francolins and guinea-fowls, crowned cranes, bustards, black-winged slits, avocets, plovers, pigeons and doves, parrots, lovebirds, touracos, hornbills, bee-eaters, hoopoes, rollers, kingfishers, woodpeckers, ravens, starlings, shrikes, oxpeckers, weavers.